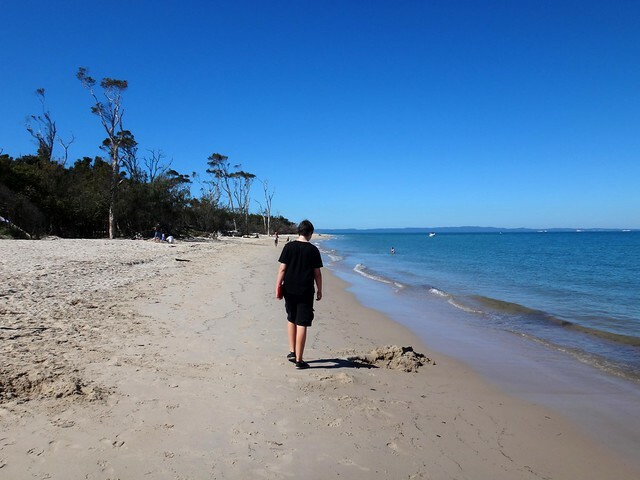 Bribie Island is a sea-side paradise, less than an hours drive from the northern Suburbs of Brisbane. The aboriginal name for the island is “Yarun”, meaning “Crab”. According to traditional legends, Yarun (or Yirrin) was a greedy man who ate too much honey. The bees smelled the honey, and covered him with wax. He ran out into the water, but the tides and the bees weighed him down. He got stuck in the mud, the wax hardened and before long he had turned into a crab. He and his people have been crabs ever since. The name “Bribie” comes from the Aboriginal word “Boorabee” which means “Koala”. 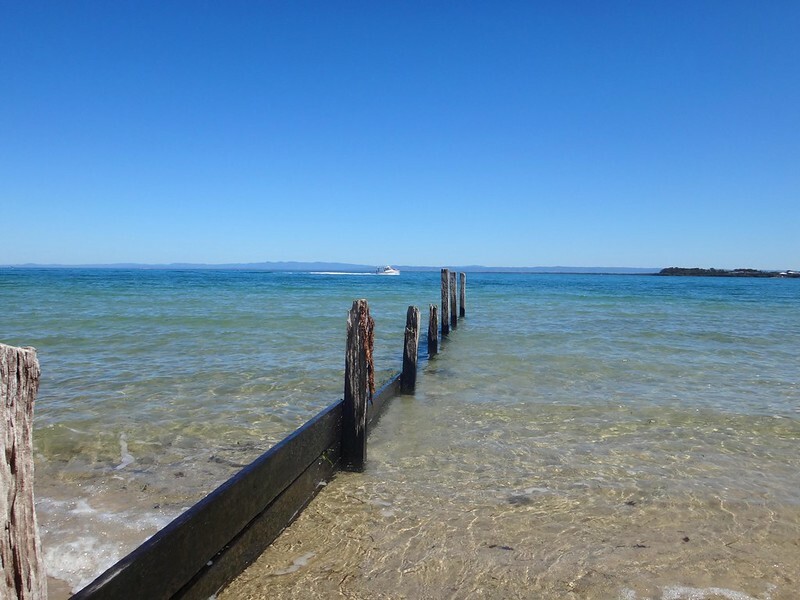 In the early days of the Moreton Bay convict settlement, several convicts escaped and made their way to Bribie Island. 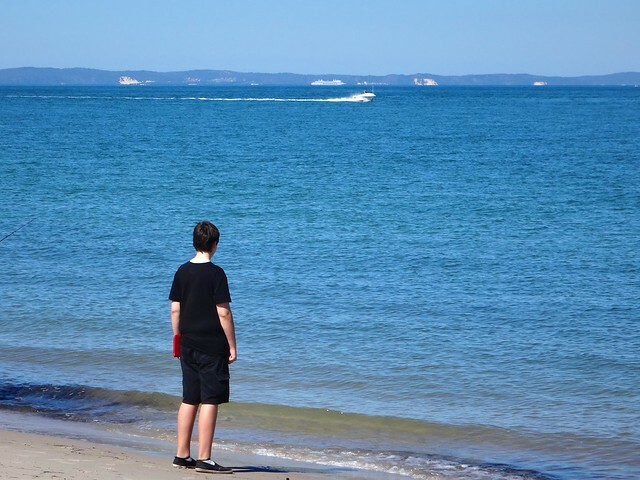 Eventually, the word “Bribie” became synonymous with disappearing from every day life: when a man from Brisbane had left town without leaving an address, people would say he had “Gone to Bribie”. 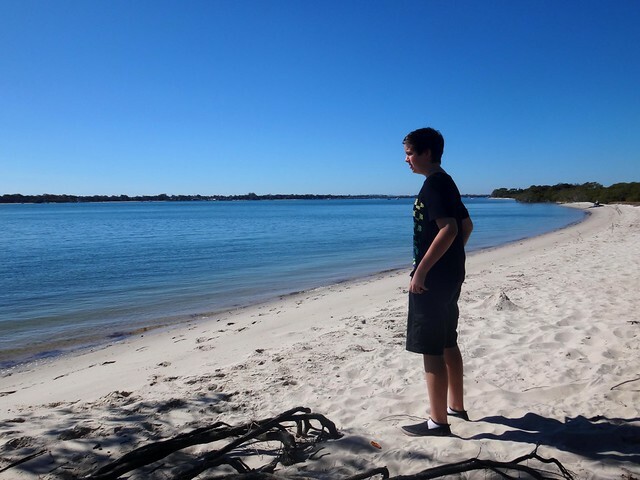 One of the stories of Bribie Island that has intrigued me for ages is the story of Kal-Ma-Kuta, a Joondaburri aboriginal woman. I’ve often driven past an unusual memorial about her, built in the middle of the busy four-lane road as you approach the Bribie bridge on the road from Caboolture, near Turners Camp Road. The memorial, erected in 1962, said that Kal-Ma-Kuta was the “Last of the Joondaburri Tribe”. Today we decided to stop and have a look, and try to answer a few questions about her. According to the plaque, this place was where Kal-Ma-Kuta (who was also known by the anglicized name “Alma”) and her husband, Fred Turner, built a house shortly after they married in 1872. They had eight children together, and lived together at this spot until Kal-Ma-Kuta’s death in 1897. The place became known as “Turners Camp” because of them. This raised another question for me: If Kal-Ma-Kuta had eight children, why did the memorial say she was the last woman of her tribe? I eventually found an old (2004) copy of Indigenous journal, “The Koori Mail”, which recounted a story that in the 1870’s oyster fisherman, Fred Turner, had a boating accident. He was rescued by a young aboriginal woman and eventually married her. Fred and Kal-Ma-Kuta had an oyster lease, and also were responsible for lighting the beacons on Toorbul Point (known today as Sandstone Point). The article also said that the Turner’s great grand-daughter, Daphne Kalmakuta Dux, had successfully lobbied local politicians to erect the newer memorial by the water. Now 85 years old, Aunty Daphne, is an artist who paints stunning works depicting her aboriginal heritage. I was able to speak with Aunty Daphne on the phone. I asked her about the “Last of her tribe” comment on the 1962 memorial. She told me, “I’m one one of Kal-Ma-Kuta’s descendants. I’m Joondaburri. So we can’t all have disappeared!” I’m glad she sorted that out. You can see some of her amazing work at Serpentine Arts. I asked a fisherman at the point if he knew about the Aboriginal fish trap, and he pointed to a spot a few metres away and said “Yes. It’s right there. But you won’t see much at the moment because it’s high tide”. The whole idea with fish traps was to build a wall of rocks that would be submerged by the rising tide. Fish would swim into the enclosure, and be trapped as the tide fell. The successful fishermen would then help themselves to fresh seafood. Before Eurpoean settlement, this place was a seafood lovers delight. What we know today as expensive Sydney Rock Oysters could be picked fresh from the rocks. Crabs, fish, dugong, turtles…. there was an abundance of good food for the local inhabitants. 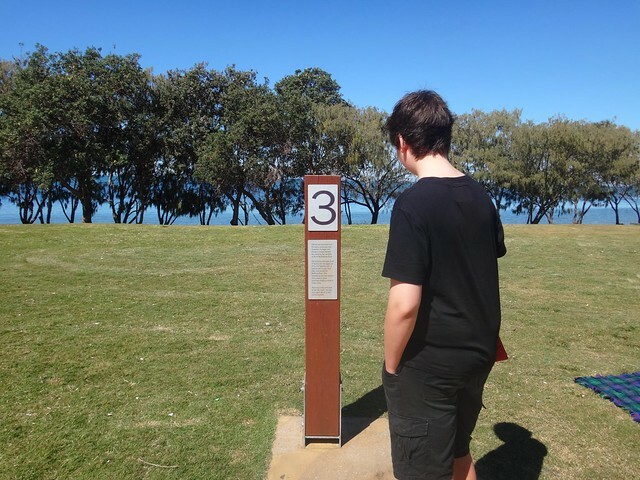 This quartet of simple markers tells the story of three english ticket-of-leave convicts who, in 1823, were shipwrecked on nearby Moreton Island. Suffering a fierce storm off the coast of Newcastle, south of Sydney, they had drifted for several weeks before being washed ashore almost 1,000 km to the north. 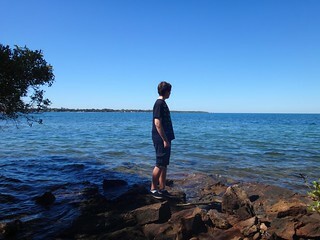 After being cared for by the Aboriginies on Moreton and Stradbroke Islands, they made a canoe, crossed Moreton Bay and came ashore at near present day Cleveland, south of Brisbane. Finnegan, Parsons and Pamphlett thought they had been washed ashore south of Sydney, so started walking northwards in the hope of going home. But instead they crossed several rivers and eventually ended up living with the Joondaburri on Bribie Island. The diet these three ex-convicts enjoyed on the islands of Moreton Bay was probably the most healthy and sumptious they had ever experienced in their short, unfortunate lives. Harrison and I visited the Museum on Bribie Island, and found this photo, by Jon Rhodes, of the same Toorbul Point Fish Trap that we had been looking for earlier in the day. It might be an idea to go back to this point at low tide and see if the fish trap is easier to see. 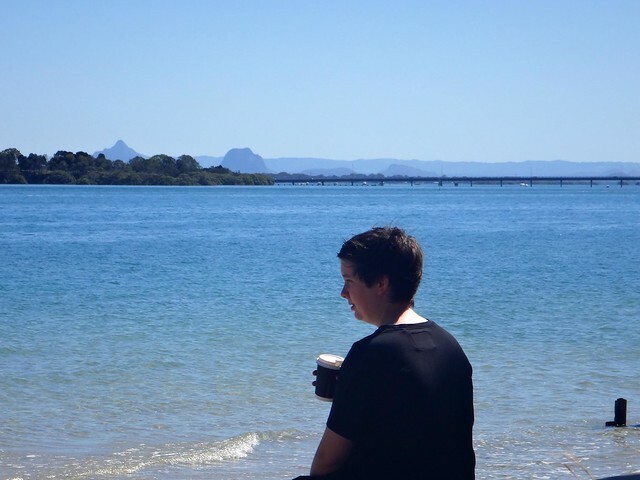 Taking a break from history, we grabbed some morning tea and sat by the water to enjoy the views of the mountains in the distance. 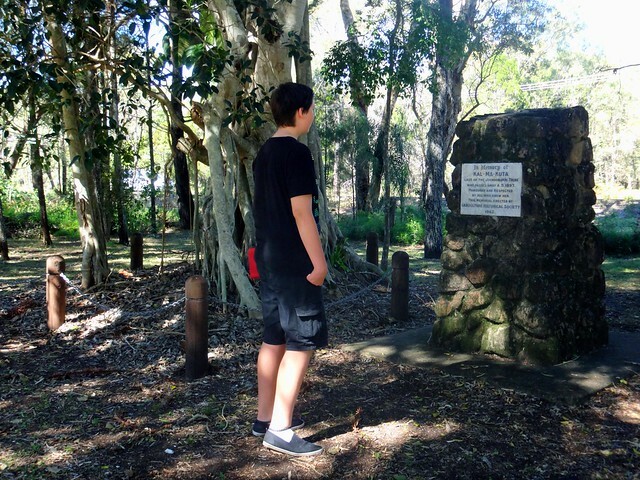 We planned to head to the southern tip of the island to check out a bit more local history. But before doing that, we wanted to have a look at “Buckley’s Hole”. This is an artificial lagoon which was created in the 1980’s when the council built a sand wall across the mouth of a slow-running creek to deter mosquitoes from breeding. 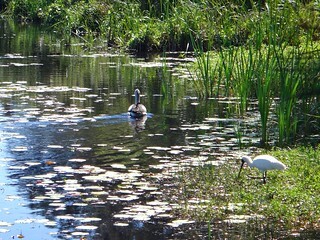 The lagoon is an important habitat for a large number of different bird species. 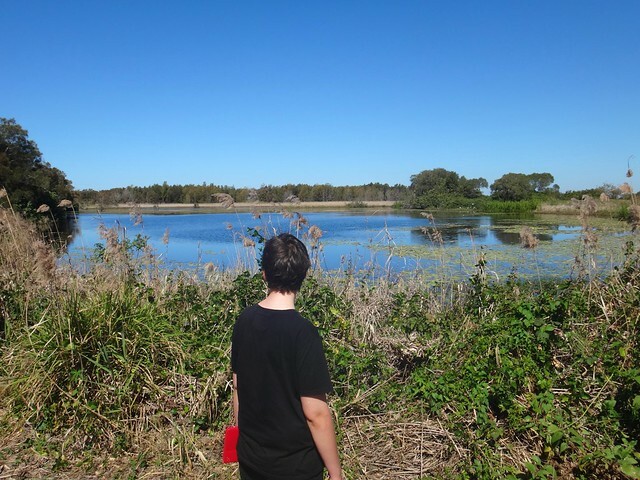 To allow visitors to observe the birds, there’s a small “hide” overlooking the lagoon. 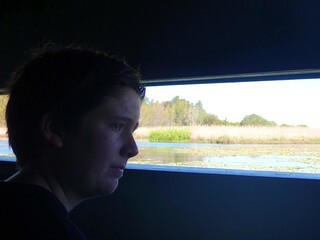 We spent a while quietly watching the wildlife from the hide. A few swallows kept flying in and out of the windows. Keen-eyed Harrison realized there were several nests inside the hide on the wall immediately behind us. 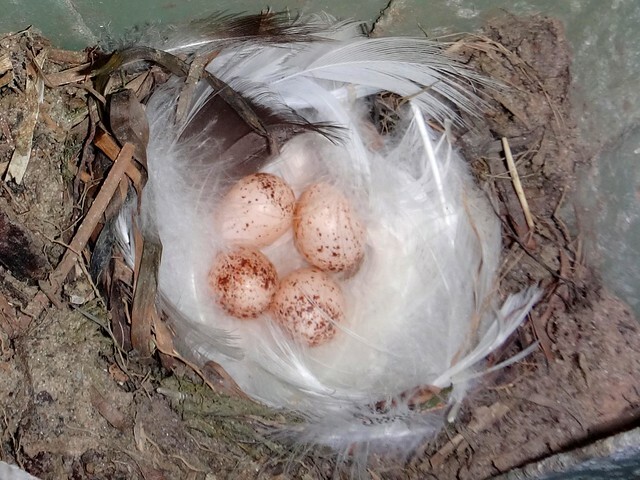 We were delighted to find some beautiful speckled eggs inside. Buckley’s Hole is also important culturally. There are a couple of shell middens nearby, formed over centuries as Aborigines gathered to enjoy shell-fish and then discard the shells. It’s also close to the first documented encounter between Europeans and Aborigines at “Skirmish Point” – as depicted in this painting by Don Brabden that we saw in the Bribie Museum. It shows Matthew Flinders rowing ashore from his sloop, The Norfolk. Funnily enough, this is also the same point where our three ship wrecked ex-convicts: Finnegan, Parsons and Pamphlet, were found almost 24 years later by an astonished John Oxley in 1823. Harrison and I made our way down to Skirmish Point. There were no old wooden sloops there today – just a flotilla of modern pleasure craft, and a small cruise ship in the distance. 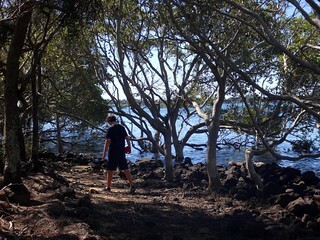 Eventually we made our way across to the eastern side of the island, or “surf side” as the locals call it. It didn’t take us long to find our final historical landmark – the old World War II bunkers in the sand dunes behind the beach. These bunkers had a couple of 155mm guns mounted on them and were capable of hitting a target 30km away. The shipping channel at this point comes in closely to the coastline, so it was an ideal point for the fortifications. The bunkers were also used to monitor the channel for submarines, and were capable of detonating submerged mines if intruders were detected. 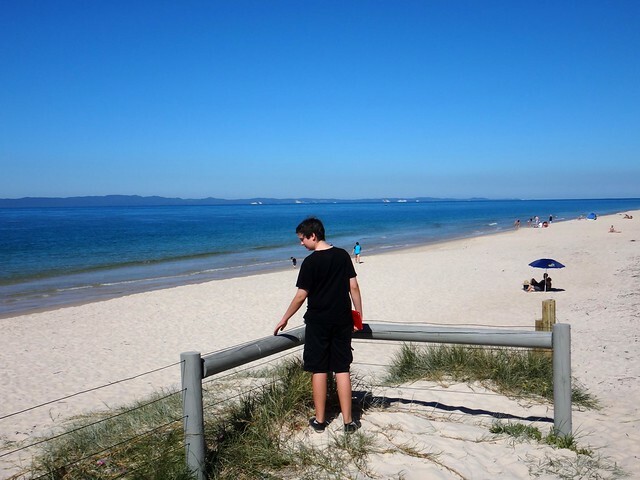 From this spot on Bribie, Moreton Island looks quite close. History lesson over, we decided to stop at a cafe in Woorim for a late lunch before heading home. Today’s trip was only 116km in the car, with about 3 hours exploring on foot, and 2.5 hours driving. Thanks Harrison for a fun day of exploration! 1. People more qualified than I suggest that the Joondaburri tribe are part of the Gubbi Gubbi (or Kabi) Aboriginal people. 2. 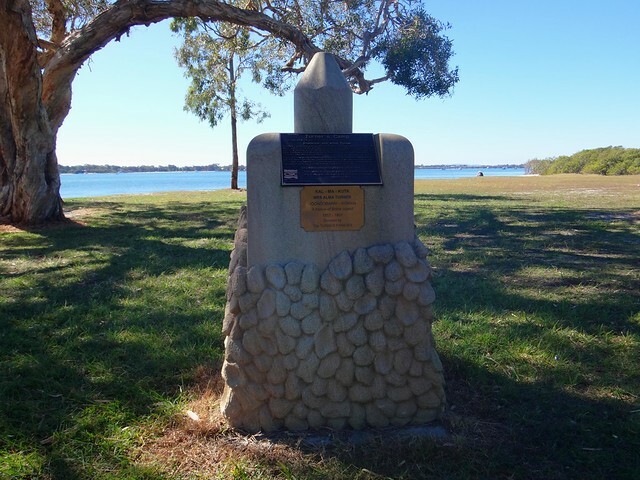 In referring to Kal-Ma-Kuta as the “Last of the Joondaburri Tribe”, the authors of the 1962 monument were probably alluding to the sad fact that most of the tribe had desserted Bribie Island by about 1880. Habitat destruction by European settlers had rendered the island unable to provide enough food for the indigenous population. 3. Aboriginal freedom fighter, Dundalli, was adopted by the Joondaburri tribe, and was involved in some gruesome conflicts with European settlers which eventually resulted in his execution in 1852.
hey Neil another great story to read and extra bit of history, great pictures, i found it interesting that in Petries book he talks of Bribie the basket weaver ex convict, maybe that’s where his name comes from in your story.I saw the pics of the Bora ring on bestaman rd, looks like you didn’t go all the way in, i did, i know the sign says your not supposed to but i wanted to see the whole thing.I forgot about only seeing the fish trap at low tide, when i was there you can sit on a little rocky out crop just next to it.I believe Ningy Ningy means-oysters according to Chris Moreton, i didn’t find much local Aboriginal history in the new Museaum last time i was there, a few years ago ..i find Bribie to be just an overcrowded island turned into another suburb of Coloundra .. Some sources say the legend of Bribie the basket weaver was just a story. Who knows? Yeah – we didn’t jump the fence at the Bora Ring. The sign said you needed a permit and that it was important to aborigines, so we stayed out – although I would have loved to see it. The museum was ok – a few new displaays. Thanks for the post, a bit more info for you. Kalmakuta was taught English by Bribie himself . She was orphaned at an early age and was the daughter of a Turrwan of the Joondaburri, born in 1854 she died in 1897 and she is buried according to Kabi tradition, i.e. when you are buried a Moreton Bay fig tree is planted above your grave. Her spirit lives on in the tree you were standing next to, she died as a result of trying to save a white man from drowning in the Passage. She was described as being the last full blood of the Joondaburri . Thomas Welsby wrote in his book “Bribie the Basket Maker” that she was one in a thousand. She was a remarkable person. Even today a total stranger to the family (a cab driver) mows the site, there are always fresh flowers there. She is always in our hearts. I didn’t know about the Kabi tradition of planting a Moreton Bay Fig Tree above a grave. What a wonderful thing to do. Kalmakuta sounds like an amazing woman – I’m glad that her memory is still honored today. Having briefly visited Bribie Island a few times over the last 15 years I feel ashamed to say I’ve not done any real touring of these sites. Having resided in the NT for many years and working with Aborigines and learning and respecting their cultural history I searched for the Joondaburri tribe in QLD, your post was one I found, thanks you, I will be visiting and touring historical areas in the near future. 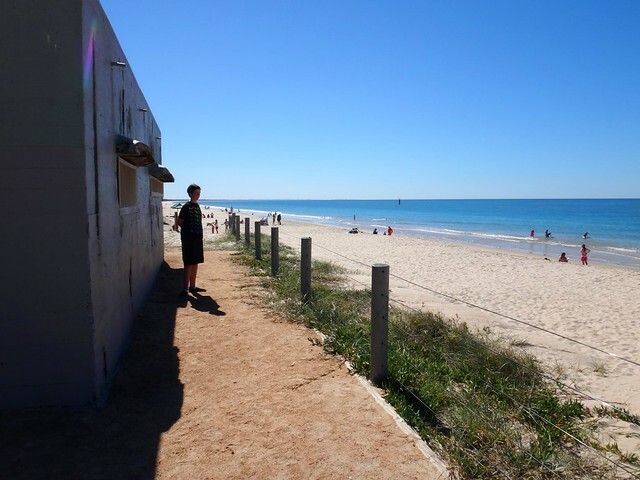 Like most places, Bribie has some really interesting stories – it’s just a matter of scratching beneath the surface and asking a few questions. Kalmakuta sounds like she was an amazing woman. I spoke with her grand-daughter, Auntie May, a while ago. She said she saw herself as a Joondaburri woman, which suggests that the old Kalmakuta memorial, while well-intentioned, was not entirely accurate. 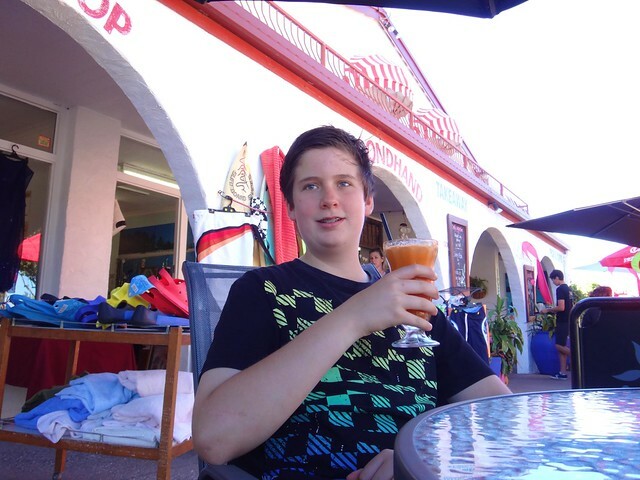 I hope you have a great time at Bribie! I spoke with Auntie May on the phone a while ago – what an amazing woman! You’re really lucky to have an ancestor like Kalmakuta. 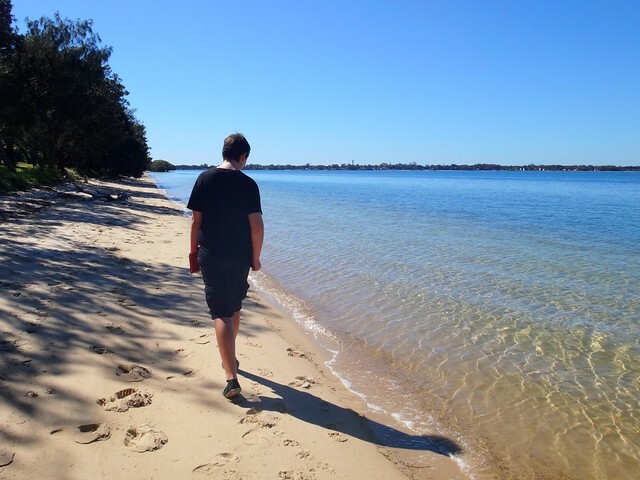 Have you been to Turners Camp on the Bribie Road? Another relative popping in to say hello! I’m a great grand daughter of Kal Ma Kuta as well, my grandmother was Alma (Marge) Woodruff nee Turner. I would love to connect in with more of the family. I am always trying to find out more stories about our family. Your grandmothers surname was Timmins not Turner, I know this as your dad and my mum were cousins. If you would like to know more about the family do a search on ancestry.com as a few of us have done a bit of research. Your grandmothers father was Alfred Douglas Timmins and mother was Alma Florence Palin. Hope this helps.